One of my favourite poems this poem about attitude. I was flipping through my first art journal, and found that I had it written down. 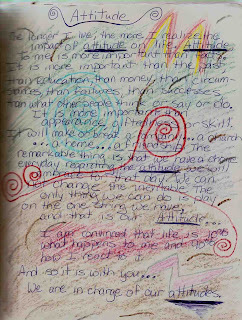 This is from my first art journal, it's almost 20 years old! So cool to come full circle and get back into something I was trying to do long ago! I had a good laugh at what fun things I tucked away in that book. For instance I found one of the first emails my brother sent me, valentine's notes, fun notes from my mum! I also found very interesting journal entries that provide some insight to the 2012 me! My creation for this week's Simon Says Stamp and Show Your Favourite Word is a remake on my Attitude page in my journal. My word is attitude. I had a vision for a picture frame, but it was not coming out as I liked. My best friend from University suggested using the colours of Tangerine Tango (my favourite) and Night of Navy. My vision continued, this time, using foam stamps using Tim Holtz Tattered Florals die. I decided to do some experimenting with some scrapbook paper (now hidden by) acrylic paints, gesso, and letters cut out with my word play die. By the weekend, my vision for my Attitude picture frame had completely changed. I have been working on it, but it isn't ready to enter into the challenge. So I will just enter my journal page...maybe I could win the random Simon Says Stamp Gift Certificate. I love seeing all your paint storkes on the page, and what a great idea to make a foam stamp using the tattered florals die! :) The Design Team are really pleased that you joined us for the Simon Says Stamp and Show Challenge this week - Thank you! What an inspirational and truthful post. You are spot on there! 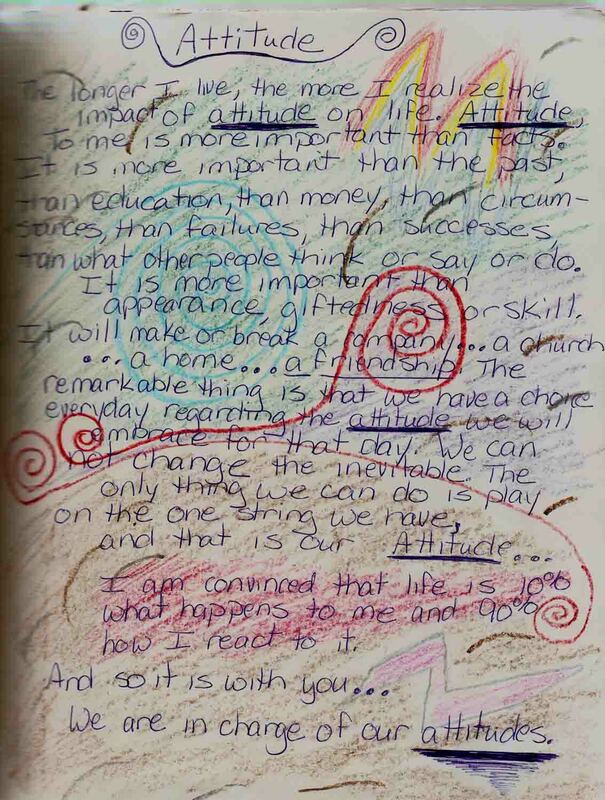 Your journal page is so vibrant and really supports your feelings on attitude being everything (or at least what we can control).